Camping Meals: The Kotlich Cook's Scrap Book - Inspired Camping. The secret of a great camping trip is a list of camping meals made easy. Particularly good are one-pot meals and easy camping food over the campfire. This is where the Kotlich Cook’s Scrapbook can help as its full of camping food ideas and healthy recipes… but it’s also so much more than that. Imagine the smell of wood smoke from an open fire, the plop-plop of a stew cooking over the crackling wood, and the friendly chatter of friends drawn to the smells like moths to a flame. This is what you get as you browse through the Kotlich Cook’s scrapbook. It’s an inspiring collection of pictures, stories, advice and tips to help you make the most of this type of cooking that fits the activity of camping like a glove. The kotlich is a Hungarian cooking pot that is suspended over a wood fire by a chain. This is one pot cooking at it’s very simplest. Used by herdsmen to cook hearty stews as they worked away from home, this helped them survive the harshest of winters. Sometimes called bogrács – which means kettle, caldron or stewpot – its distinctive round shape makes it very recognisable. It is made of either stainless steel, porcelain, cast iron, or copper with some pots containing an enamelled coating. 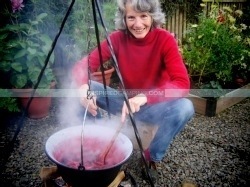 The Kotlich cook, Trish MacCurrach, became an avid outdoor cook while working in Serbia for several years. Her experience with this style of cooking was “love at first sight”, and she hasn’t looked back since. Her scrapbook is an expression of her desire to motivate others to explore this very enjoyable way of cooking outdoors. In it, she shares useful tips for beginners, seasonal healthy food ideas, jam and jelly recipes and inspirations for the different places the kotlich can be set up. She even includes a recipe for our favourite tea… Chai. Since returning to the UK she has been selling outdoor cooking kits and demonstrating the benefits of getting outside, and growing and cooking fresh food. Ideal for camping meals you can find a kotlich, tripod and colourful enamel cookware at her site Outdoor Kitchen. During January 2013 if you order kotlich set of two or more pieces you will get a free copy of the scrapbook thrown in (worth £8 including P&P). Simply quote ‘Inspired Camping’ in the customer note section at the end of the buying form. This is a scrapbook ideal for anyone wanting to explore outdoor cooking and gatherings with friends. It is simply an expression of the Kotlich cook’s desire to motivate others to explore this very enjoyable and easy way of cooking outdoors. It is a seasonal guide set out simply, with plenty of pictures to wet the taste buds and inspire you to try some new ideas. We wish the Kotlich cook had included a few more recipes and inspirations as this enjoyable read seemed to come to an end too soon. This is a scrapbook full of cooking adventures and inspirations, with useful and practical introductions for first-time users of the Kotlich kit. If you have a product you would like us to honestly review we’d love to hear from you so please say hello.